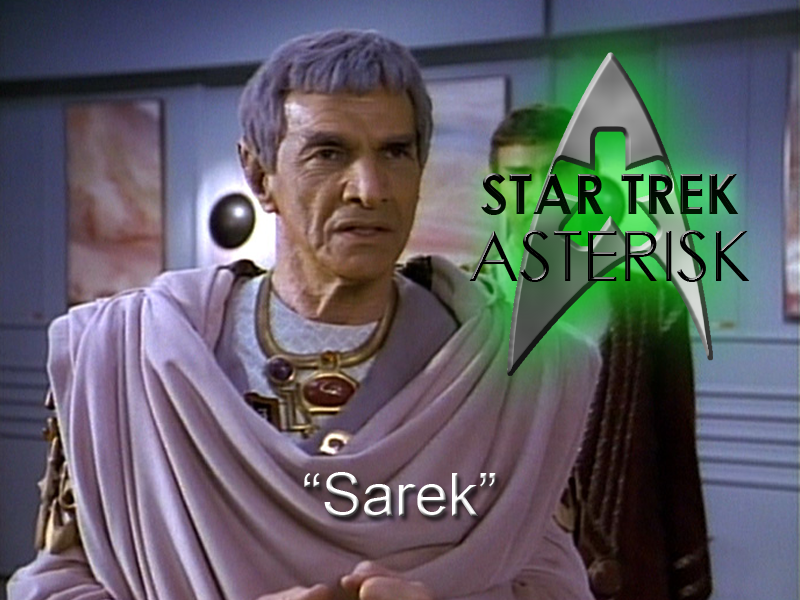 Ambassador Sarek has a sick, sick mind, and it's affecting the crew of the Enterprise. 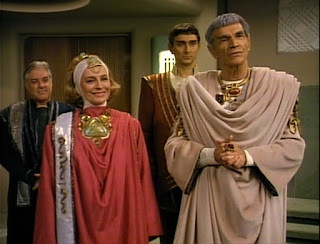 Sarek has been working on a diplomatic mission with the Legarans for a very long time and on this final, crucial step of the process, he has been brought aboard the USS Enterprise to negotiate a treaty. Before he beams aboard, however, his aids come first and warn Picard that Sarek is growing ill in his old age and won't be able to attend any of the social functions he might normally take part in as an ambassador. Picard is disappointed, but understands, and then Sarek beams aboard with his wife, Perrin. He wants to get to work immediately preparing the ship for the Legarans' arrival. And the aids just roll their eyes. Wesley and Geordi and preparing a vat of ectoplasm for the Legarans (although Wesley really wants to hurry because he somehow got a date) when Sarek comes in and points out everything wrong with the room. Geordi assures him that the room will be ready in time for the Legarans' arrival, but Sarek still seems uncharacteristically upset and stressed. So his aids bring him back to his quarters and decline a tour of the ship. Such a pity, however, that Sarek will not be able to attend the concert Picard set up for him, but the concert will go on, and Troi suggests inviting at least Perrin. So Picard does, and Sarek ends up joining his wife at the concert, much to his aids' protest. Hello, friends, I am here. Back at the ectoplasm vat, Geordi and Wesley get really irritated with each other and Geordi insults Wesley saying basically he's not going to get lucky with his date. It almost comes to blows, but Riker defuses the situation before it comes to that. Back at the concert, reports have come in of similar confrontations around the ship. And while Data and company play a piece in the style of Tataglia, Sarek and his party leave early because he started to cry. 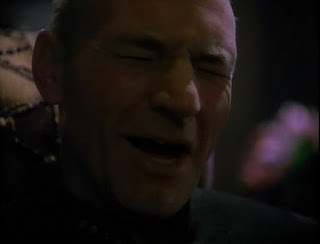 Well, then Wesley gets into a fight with his mom and an all-out bar brawl happens in 10-Forward, so Picard, Crusher, and Troi come to the conclusion that Sarek is suffering from Bendii Syndrome. Crusher explains that Bendii Syndrome affects Vulcans over 200 years old and causes them to lose their emotional control. Because of the Vulcans' natural telepathic powers, it often affects those around them. So Picard confronts first Perrin and then Sarek about the disease. 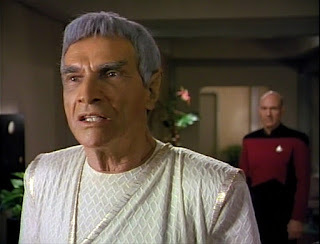 Then Sarek requests to be left alone with Picard to discuss it, and, while insisting to Picard that he is in perfect health, he becomes visibly shaken and upset. Picard points this out, and the only logical conclusion is that he is, in fact, sick. His Vulcan aid has been holding his mind together for him all this time, but the stress of this particular mission made this an impossible task. The first reaction is to postpone the meeting with the Legarans, but that would ruin all of Sarek's diplomatic work. 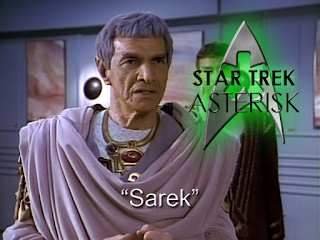 Sarek has another solution, but he needs Picard's help, and it's not going to be pretty. In a room alone with Beverly, Picard greets Sarek and they sit down for a mind meld. Sarek's mind to Picard's mind, Sarek's thoughts to Picard's thoughts. During the meld, all of Sarek's emotional instability passes into Picard, and Picard's mind helps to bolster Sarek's control. Afterwords, Sarek, who is now partly Picard, calls Riker "Number One," and asks him to accompany him to the meeting with the Legarans. Meanwhile, Picard, who is now partly Sarek, starts losing his mind. He feels all the sadness, all the anger, all the stress that has been raging deep inside the Vulcan. And, perhaps most poignantly, all the love. Through Picard, Sarek expresses his love for Perrin; for Spock, his son; and for Amanda, Spock's mother. He expresses his anger that he was never able to tell any of them. He weeps, he laughs, he yells, and it's all Crusher can do to keep him company through his terror. Meanwhile, the meeting with the Legarans is a complete success. 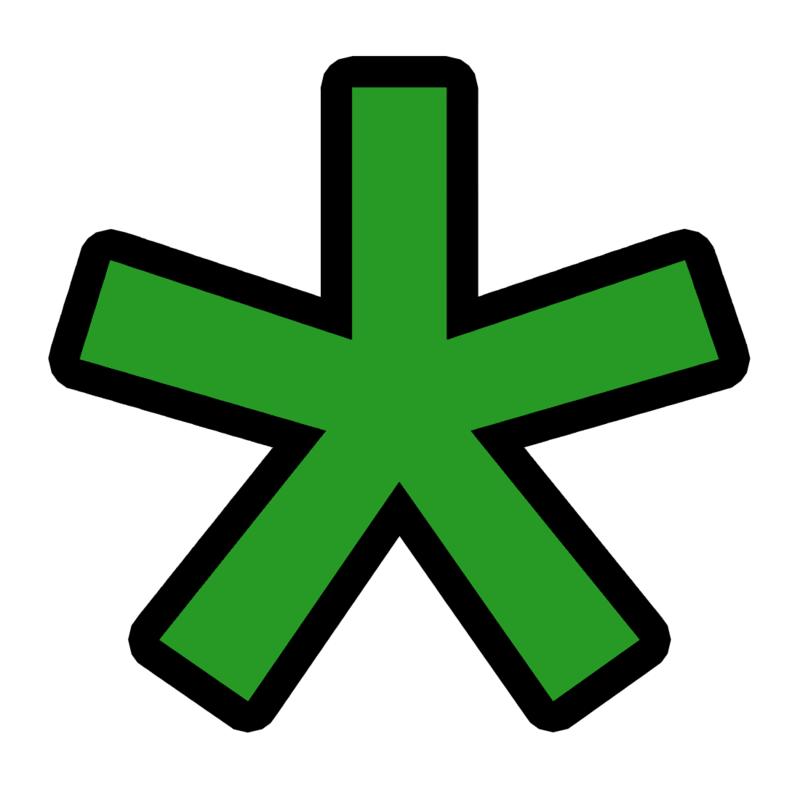 "I-Chaya! I even loved that inferior beast!" Afterwards, Picard, now free of the mind meld, meets with Perrin in the transporter room and tells her that Sarek really loves her. She says that she knows. That she always has known. Sarek enters and, perhaps because of the clarity the mind meld gave him, as he steps onto the transporter, he holds Perrin's hand as they dematerialize off of the Enterprise. I'm telling you, Patrick Stewart's performance while Picard is under the effect of the mind meld is amazing and precisely, I think, why he was chosen for the role. Even without that performance, though, this was a great episode exploring the depths of Vulcan emotions and the lengths to which they go to suppress them. As well as the effects of this suppression on those they, in all actuality, love. Three thumbs up for this episode.